This was a much requested post by you guys so I am so excited to finally be sharing my skincare routine with you guys! 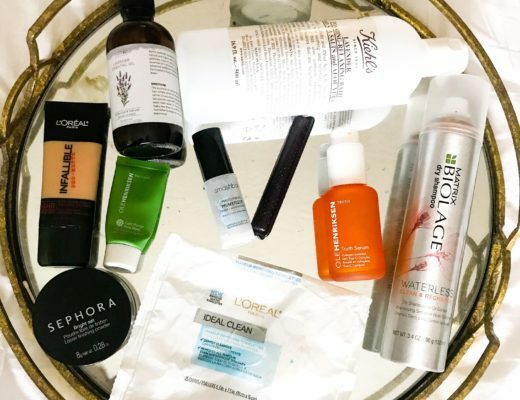 While [in my opinion] it’s not super excessive, it’s the right mix of product that keeps my skin looking fresh and healthy. My skin is probably the best it’s ever been right now [I go sans makeup a LOT] and I truly believe this routine and these products are to thank for that. So, without any further adieu, here is my skincare routine and stand-out products! I workout first thing in the morning and then shower immediately after. In the shower, I use this cleanser [and also use this once or twice a week] and I love the scent [it’s not too strong]. It takes off any sweat or residual gunk from my sleep or workout and it does the job. I actually got sent it in PR but fell in love. Then, once I’m out of the shower, I first apply this serum, which is my holy-grail. I let that settle in while I get dressed and then immediately apply a thick layer of this. I LOVE this moisturizer and I truly feel it’s made my skin more full and bouncy. After that, regardless of whether I’m wearing makeup or not that day, I’ll apply a thin layer of this to set everything. It’s an amazing primer but also a great lightweight moisturizer. Then, I’ll either go into my makeup routine or head out the door! Once I’m ready to unwind from the day, my first step it to remove my makeup with this on a cotton round. This is by-far the best makeup remover I’ve ever used and it’s super affordable. Then, I’ll take one towelette from these and swipe off any remainder that the micellar water didn’t get. Because of the micellar properties, I don’t even feel the need to slather on a moisturizer after. Instead, I layer on a generous coat of this, which is another holy-grail product of mine. After that, I’ll dot on some of this under my eyes. I’m switching between that and this, but for nighttime, I really prefer the gel because it soaks in while I’m sleeping. And that’s it! Super fast and easy but doesn’t leave me feeling greasy overnight and my skin wakes up still feeling nourished and clean. Two product categories that will always be in my skincare routine are face masks and facial sprays. I’ve tried a million of each over the years [I’ve shared my favorite masks on the blog before and I still do love all of those] but these are the ones I’ve been loving recently. For sprays, I really love dousing my skin with this after just waking up before the gym. It’s a great refresher and the collagen in it is great for your skin. Throughout the day, I’ll mist some of this on [whether I have makeup on or not] and it’s a lovely mist. 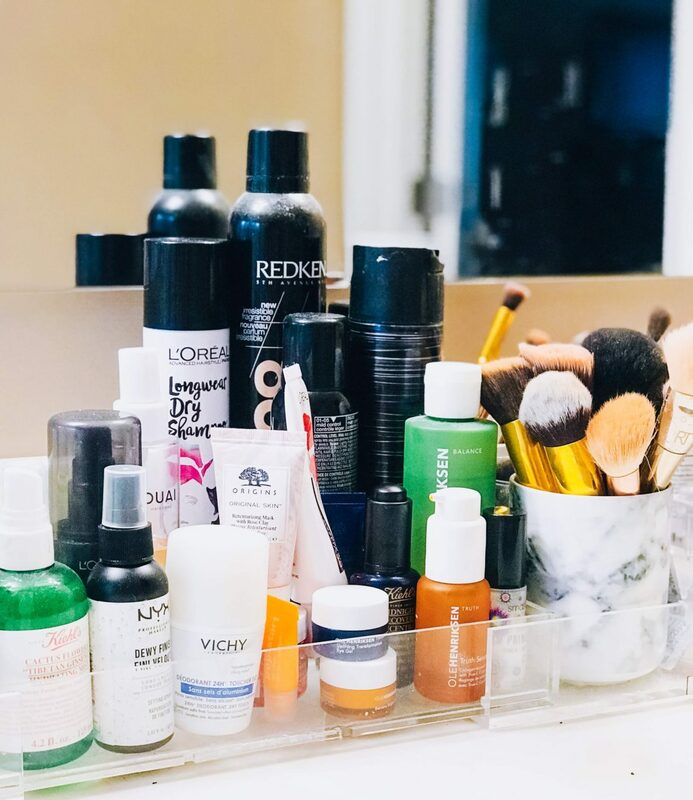 I’ll often use this one after my night-time routine to really lock the products down. It’s also actually really great in your gym or pool bag. As far as masks go, you can reference this post for past favorites, but I’m currently really loving this one for a good exfoliation and this one, this one, and this one for glow. Clearly glowing skin a priority for me! So, there you have it. The products I’m loving and religiously using right now to take care of my skin. Now that I’m in my 30s, I’m really conscious of what I’m using and how I’m taking care of myself. My skin is definitely a huge priority for me and I am always exploring and trying new products. But these are definitely the ones I go back to over and over. You can also shop my acrylic organizer, makeup brushes, and eyelash curler. 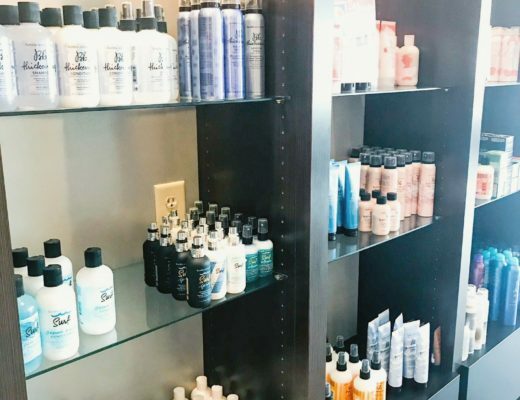 Let me know if you have any questions or if you know of a product I should try based on the ones I love above. Thanks for stopping by!